Speaking on: "The Dynamics of Affect in Online Learning"
Student affect develops in complex ways as students use online and blended learning systems. In this talk, Prof. Ryan Baker will discuss his lab's work to understand the development of learner affect over time. This work has several dimensions -- how long an affective state persists once it begins, how frequently one affective state transitions into another state, how affect impacts learner behaviors and study habits, and the impact on long-term student outcomes. Baker will discuss these issues using data from a range of online learning systems, from intelligent tutoring systems to simulations, and across both micro (second-by-second) and macro (8 year) time scales. He will discuss how automated log file detection of affect is emerging as a key method for studying affect dynamics as well as more traditional methods such as classroom observation and video coding. 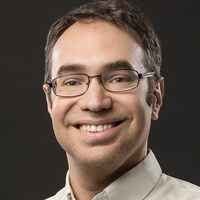 Ryan Baker is Associate Professor at the University of Pennsylvania, and Director of the Penn Center for Learning Analytics. His lab conducts research on engagement and robust learning within online and blended learning, seeking to find actionable indicators that can be used today but which predict future student outcomes. He was the founding president of the International Educational Data Mining Society, is currently serving as Associate Editor of two journals, was the first technical director of the Pittsburgh Science of Learning Center DataShop, and currently serves as Co-Director of the MOOC Replication Framework (MORF).